I’m a Gen Y professional in my first job post-education. Lucky for me, I chose an intensely creative field. But my friends in other industries who also have joined the 40-hour-a-week grind complain that they’re working in environments with bland colors, bad lighting, and tight quarters. It’s true: most workspace don’t feel like home, or anything even close to it. They don’t convey excitement, and they express minimum character. So, what I suggested to some friends and colleagues during a recent “happy hour design consultation” is that they create a personal connection to the places where they work. It’s one of the best ways to improve productivity, feel comfortable, and make those long hours of overtime more bearable. But I wanted to take it a step further to provide five specific ways they can increase productivity. And here they are! Make your workspace more you! Taking the initiative to make your workspace more attractive can be an important step toward being more productive. Find out if you can paint the walls around you and, if so, add a soothing or stimulating color that you love. 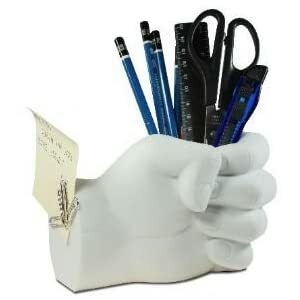 Add tasteful photos of loved ones or some fun supplies to aid in organization — like a hand that holds writing utensils for you. And, of course, keep a clean desktop to bring more focus to both your particular tastes and professionalism. Plants and fish are a great way to add life to a lifeless workspace. Skip out on the fake ones and use only living. Get some wheat grass you can grow over time (and then feed to your cat if you prefer). Maybe a larger, seasonal flowering plant would bring a pop of color to a bleak landscape. If you prefer animals over plants, you may enjoy a USB-powered aquarium. The USB-powered aquarium comes equipped with a pen holder, LCD calendar with weather information, nature sounds, overhead light and gravel filtration. Of course, you supply the fish. Everyday starts with a plan. Make the day more successful by listing the things you would like to accomplish that day aside from attending necessary meetings and noting important due dates. Maybe you can grab a whiteboard with funky markers and create a doodle each day to signify your particular mood. Mask boring old manila folders in more vibrant accordion file holders instead. If you’re like me and don’t (yet!) have an ipad, then you may enjoy Kate Spade’s chic personal agenda, the old-school way to avoid double-booking. Sometimes, headphones can be a lifesaver! And they don’t have to be the standard black and gray headphones, either. Check out these fun bow headphones that will make even the most grumbly person smile. But when I need to focus on the task at hand, it’s just not possible to quiet the bustle of a busy office. Noise-canceling headphones abound (and are great for working while traveling on planes, busses, and trains, too). But what to listen to? I suggest some minimal techno music with driving, consistent beats — like Ricardo Villalobos — to make some serious progress at work. If I really need meet that tight deadline, I’ll bring out the big guns: Beethoven’s 7th Symphony! I make sure not to wear my headphones all the time, so I’m available for collaboration and idea sharing: but sometimes it’s just the trick! There’s really no product for this that works as well as just getting up out of your chair. Research has shown that exercise boosts productivity and morale in the workplace. Take a short walk at lunch to relieve stress and clear the mind. You may have a gym facility within your office building or you may enjoy this exercise chair for your home office. Take the time to disconnect, stretch, and exercise your laugh muscles — you’ll feel better for it. Want more? Check out 50 ways can increase your productivity.